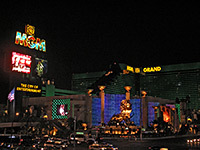 In terms of the total number of guest rooms, MGM Grand may have lost the title of biggest hotel in Las Vegas to the Venetian-Palazzo development but in other respects this remains the largest and most impressive casino in town. 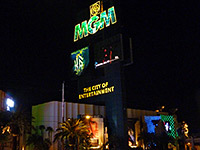 The complex covers most of a half mile square block near the south end of the Strip next to the busy intersection with Tropicana Avenue; its main building is an imposing 30 storey cross-shaped tower clad in emerald green glass and containing over 5,000 rooms, while a little way to the north rise three sleek, 40-storey towers - Signature at MGM Grand - each containing 576 condominium suites aimed at the permanent or long-stay market. The top floors of the main building house the SKYLOFTS at MGM Grand - luxury two-storey suites priced from $1,000 to $10,000 per night, and which are generally regarded as the best places to stay in all of Las Vegas. Other parts of the MGM Grand site include a 170,000 sq ft casino (the largest along the Strip), a 380,000 sq ft smoke-free conference center, the 16,800-seat Grand Garden Arena, and the Grand Pool Complex - 6.6 acres of gardens, pools, whirlpools and a 1,000 foot river. There are 12 main restaurants plus various cafes, seven bars & nightclubs, a wedding chapel, and a fine selection of shops. The 30,000 sq ft Grand Spa features steam rooms, saunas, treatment rooms and a state-of-the-art fitness center. The resident top show is KÀ by Cirque du Soleil, a combination of acrobatics, puppetry, multimedia, martial arts and fireworks. 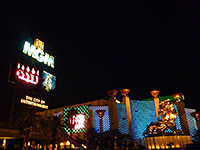 The abundance of facilities and services at MGM Grand fully justifies its two mottos of 'The City of Entertainment' and 'Maximum Vegas'. The complex also contains the southernmost stop of the 4-mile long Las Vegas Monorail, giving quick access to casinos to the north, as far as Sahara. One more unusual attraction at MGM Grand is the Lion Habitat - a glass-walled enclosure within the casino that houses up to six lions. 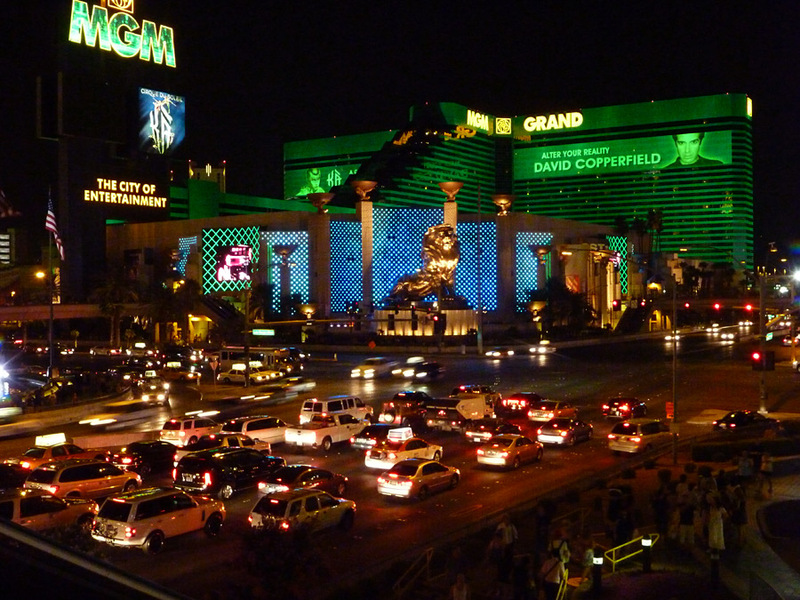 The leonine theme is also represented by a large golden lion statue at the corner of the property, by the Las Vegas Blvd-Tropicana Ave intersection, reflecting the famous cinematic emblem of the original MGM company (Metro-Goldwyn-Mayer). When built, the hotel had decor and embellishments influenced by the Wizard of Oz film but most have since been removed, and now the style is based more generally on the classic era of Hollywood.